UPDATE - Friday 23 September: Google's certificate is now accessible here. Today, we’re glad to announce that we have self-certified our adherence to the EU-U.S. Privacy Shield framework. The Privacy Shield establishes a new framework for transfers of personal data from Europe to the United States. It is a significant milestone for the protection of Europeans’ personal data, legal certainty of transatlantic businesses, and trust in the digital economy. From now on, Google has committed to applying the Privacy Shield’s principles and safeguards to EU-U.S. transfers of personal data, by default. No action is required on our customers’ part. Google’s certificate will soon be accessible here. , and have been working to build features that better address the needs of enterprise customers. Today, we’re excited to announce one of these new features: workspaces in Google Tag Manager and Tag Manager 360! Until now, all tag changes were prepared in a single container draft before being versioned and published. This sometimes led to complicated workflows and workarounds for multi-user teams and their agencies. Workspaces give you more than one space to do your work. Teammates can now easily work on tags at the same time, or make quick changes without publishing everything that’s in the works. Simply create a new workspace, make your changes, and hit publish. Tags, triggers, and variables being worked on in other workspaces will remain unaffected. What happens if tags you’re working on in one workspace are changed in another? Not to worry. Tag Manager will let you know if there are conflicts when a new version is created. Then it will guide you through merging them into your workspace with an easy-to-use conflict resolution tool! You’ll also notice that we've made the Google Tag Manager and Tag Manager 360 interfaces faster and easier to use. Need to enable a built-in variable while working on a tag? Sliding screens let you configure related tags, triggers, and variables without dropping out of your current editing flow. Want to know which tags a certain trigger is applied to? Trigger and variable screens now tell you exactly where they’re being used. Not sure what type of variable to use to grab a value from your site? Configuration screens are now easier to read and include more in-line guidance. Starting today, Tag Manager 360 customers will be able to create unlimited workspaces in their containers! Having unlimited workspaces is ideal for the large organizations and complex collaboration efforts that Tag Manager 360 was designed for. If you’re a Tag Manager 360 customer, or a customer of another Google Analytics 360 Suite product, reach out to your Account Manager to learn more. Users of the standard version of Tag Manager will also benefit. All containers will be enabled for up to three concurrent workspaces (a default workspace—similar to the container draft today—and two additional custom workspaces). The enhanced interface will also give you greater visibility into exactly what changes are being made when you hit publish. We'll keep thinking about how to make tagging easier for you. We already have improvements planned for workspaces and other areas of Google Tag Manager and Tag Manager 360 to make our products even more powerful and easy to use. We’ll have more to share soon! Companies of all sizes use Google Tag Manager, but larger organizations often have very different needs than others. That’s why, over the past year, we’ve launched Google Tag Manager 360, and have been working to build features that better address the needs of enterprise customers. Which TV Ads Made the Podium During the 2016 Olympics? 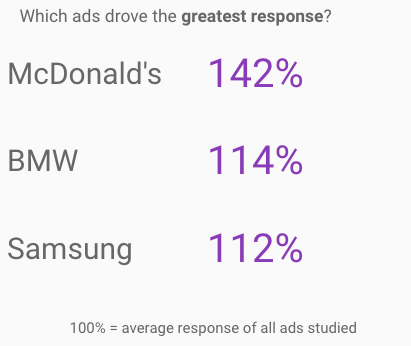 "Unlimited" ads were the big winner with almost 35% of respondents having remembered seeing the ads when prompted. Including an ad with the first quadruple amputee to summit Mount Kilimanjaro, Nike's powerful ads outpaced typical recall rates in the 20%-25% range. Coca Cola was a close second with their "That's gold" ads which mixed Olympic competition with everyday moments. Tide, McDonald's, and Samsung rounded out the top five with respectable recall rates. On overage, ad recall rates for the top five improved 3% percentage points from the initial analysis following the opening ceremonies. Almost 35% of respondents remembered seeing the Nike ads. Additionally, of those respondents recalling the ad, only 37% could recall the specific product or service featured in the ad. The net is that only about 13% of viewers can recall both the brand and product in a specific advertisement. Tide's"Small can be powerful" ad with Simone Biles had the highest product recall rate at just over 50%. Advertisers also want the ad to shift perceptions and create interest in the product or service featured. By surveying both viewers who did not see the ad (unexposed) and those who did see the ad (exposed), we are able to get insights into the impact of each ad’s messaging and creative. Overall, the results were impressive. On average, respondents who saw the ads were 27% more positive about the associated brands than those who did not. Likewise, respondents who saw the ads were 32% more likely to find out more and/or purchase the product being advertised. Compared to the lift measured during the opening ceremonies, both favorability and intent increased significantly over the span of the Olympics increasing ten and twelve percentage points respectively. Consumers who saw the ads, were on average, 25% more positive about the brand and were 28% more likely to find out more or purchase the product in the ads. Interestingly, the baseline favorability and purchase intent for both non-sponsors and Olympic sponsors are relatively equal. However, non-sponsors saw a greater lift than sponsors with three more percentage points for favorability and seven more percentage points for intent. These commercials don’t just make us laugh or make us feel better about the brand — they also make us search and visit websites. Second-screen searching—whether it’s to re-engage with the ad or to learn more about the product — is a powerful indication of desire. By measuring incremental search queries on Google during the broadcast that are specific and modeled to be attributable to ads shown, we are now able to include responses in our analysis. During the broadcasts, TV ad driven searches were almost exclusively on mobile — 83% compared to an average of 55% for those brands when the ads were not airing. For brands, that means a presence on the TV screen isn’t complete without a strategy for small screens, as well. "83% of searches on Google as a result of seeing the ads occurred on phones and another 10% occurred on tablets making a second screen strategy key to TV advertising." BMW featured multiple products including a "Performance wheelchair" and garnered the top spot on the podium with a response strength index of 3.21. McDonald’s and Samsung fought it out for the silver and bronze with 2.01 and 1.57 respectively. The answer to the question “Do emotional ads work as well as product ads?” is, in this instance, “Yes.” Both emotional and product ad creatives drove 50% more searches on average. Also interestingly, ads by non-sponsors drove 17% more searches than their sponsor counterparts. Compared to the average of the top 12 ads studied, BMW drove 3.2 times more searches. Finally, Coca Cola was the overall winner with strong full-funnel performance placing in the top three across all three funnel stages. Whether people are tuning into the Olympics or their favorite TV show, they use their smartphones to search for information triggered by what they’re seeing. In these micro-moments, advertisers need to be there, be useful, and be accountable. That means if you advertise on TV, you can now get a new view of performance across each stage of the funnel — using a combination of consumer surveys and digital response, all in a matter of days. Armed with these new insights, advertisers are now able to better understand and improve the performance of these investments in concert with their digital media. Using Google Surveys 360 to provide consumer ad awareness and interest research, an online survey was conducted in the United States during the period 8/19 - 8/21/16 using a validated, representative sample with a minimum of 700 respondents. Response data is based on incremental TV ad-driven search queries (Google) during the course of the broadcast that are specific to the ad shown and are modeled by Google Attribution 360 to be attributable to the airings of the commercials. Response data is normalized for total ad impressions during the broadcast for each advertiser. Note: Now that the 2016 Games are over, we've updated the analysis from the original opening ceremonies post to look at TV ad performance for the entire Olympics. Which ads were noticed by the audience? Which ads drove interest, shifted perception, and increased intent? And, which ads drove actual consumer response? To get some insights into these questions, Google evaluated the top 12 brands totaling over 3.5 billion impressions that aired ads during the NBC broadcasts of the event. The analysis is based on a combination of consumer surveys and second-screen (mobile, desktop, and tablet) response data. 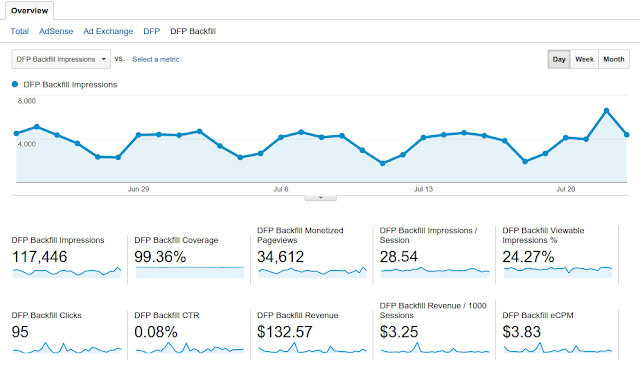 Presented in a live Google Data Studio dashboard, the result is a unique view into the full-funnel performance of the ads evaluated. Nike's "Unlimited" ads were the big winner with almost 35% of respondents having remembered seeing the ads when prompted. Including an ad with the first quadruple amputee to summit Mount Kilimanjaro, Nike's powerful ads outpaced typical recall rates in the 20%-25% range. Coca Cola was a close second with their "That's gold" ads which mixed Olympic competition with everyday moments. Tide, McDonald's, and Samsung rounded out the top five with respectable recall rates. On overage, ad recall rates for the top five improved 3% percentage points from the initial analysis following the opening ceremonies. Visualizing data has never been easier! These new connectors are now available to all Data Studio users. 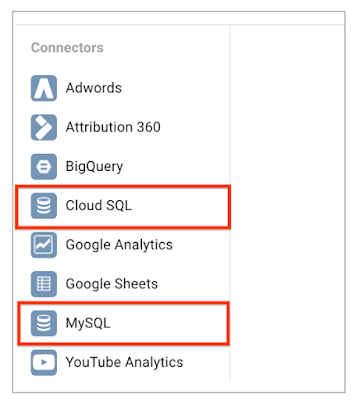 Learn more about the connector in our MySQL Connector and Google Cloud SQL Connector help documentation. Need a new connector in Data Studio? Is there a specific data service you wish to be able to access and visualize through Data Studio? Let us know through this Data Studio connector feedback form so we can prioritize and make it happen! Our vision for Google Data Studio is to enable customers to access, visualize, and share all their data, regardless of where that data resides. 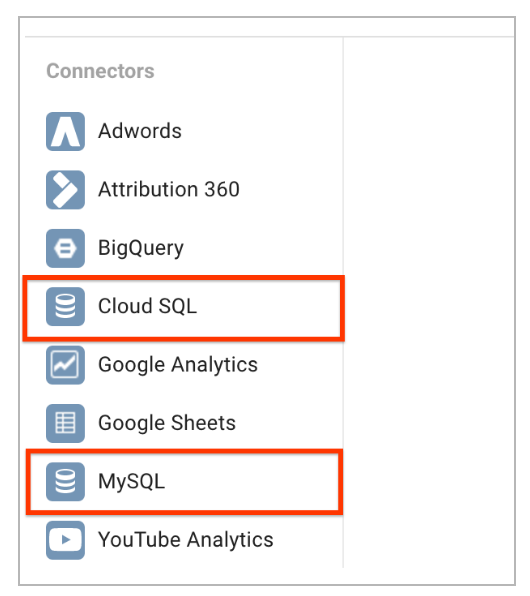 Today we are adding support for the popular Google Cloud SQL and MySQL databases. This is the beginning of making your first party data available through Data Studio. Which TV Ads Made the Podium During the 2016 Olympics Opening Ceremonies? To get some insights into these questions, Google evaluated the top 10 brands (based on total ad minutes) that aired ads during the live broadcast of the opening ceremonies. The analysis is based on a combination of consumer surveys and second-screen (mobile, desktop, and tablet) response data. Presented in a live Google Data Studio dashboard, the result is a unique view into the full-funnel performance of the ads evaluated. 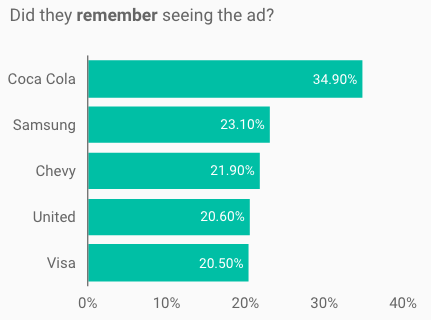 Coca Cola was the big winner with almost 35% of respondents having remembered seeing the ad when prompted—a result that outpaces typical recall rates in the 20%-25% range. Not a surprising result from a top CPG brand. Samsung, Chevy, United, and Visa rounded out the top five with respectable recall rates. 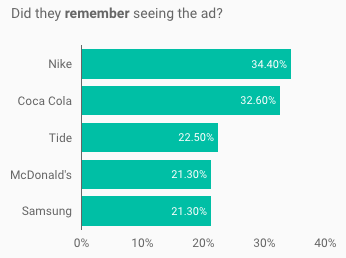 35% of respondents remembered seeing the Coca Cola ad. Additionally, of those respondents recalling the ad, only 40% could recall the specific product or service featured in the ad. The net is that only about 8% of viewers can recall both the brand and product in a specific advertisement. For many of the ads this was the first airing and it is reasonable to expect these numbers to improve substantially with increased exposure over the next couple of weeks. Advertisers also want the ad to shift perceptions and create interest in the product or service featured. By surveying both viewers who saw the ad (exposed) and those who did not (unexposed), we are able to get insights into the impact of each ad’s messaging and creative. Overall, the results were impressive. On average, respondents who saw the ads were 18% more positive about the associated brands than those who did not. Likewise, respondents who saw the ads were 16% more likely to find out more and/or purchase the product being advertised. Consumers who saw the ads were 18% more positive about the brand and were 16% more likely to find out more or purchase the product in the ad. These commercials don’t just make us laugh or make us feel better about the brand—they also make us search and visit websites. Second-screen searching—whether it’s to re-engage with the ad or to learn more about the product—is a powerful indication of desire. By measuring incremental search queries on Google and YouTube during the broadcast that are specific and modeled to be attributable to ads shown, we are now able to include responses in our analysis. During the opening ceremonies, TV ad driven searches were almost exclusively on mobile—94% compared to an average of 56% for those brands when the ads were not airing. For brands, that means a presence on the TV screen isn’t complete without a strategy for small screens, as well. "94% of searches on Google and YouTube as a result of seeing the ads occurred on mobile devices." 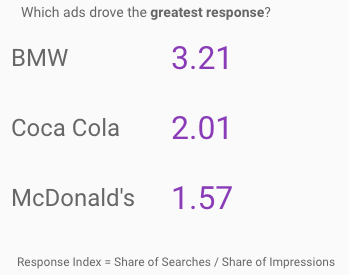 McDonald’s took the top spot on the podium with 42% more searches than the average. BMW and Samsung fought it out for second and third with 14% and 12% respectively. The answer to the question “Do emotional and inspiring ads work?” is, in this instance, “Yes.” But so do product-featured ads. Both inspiring and product ad creatives drove 10% more searches on average. 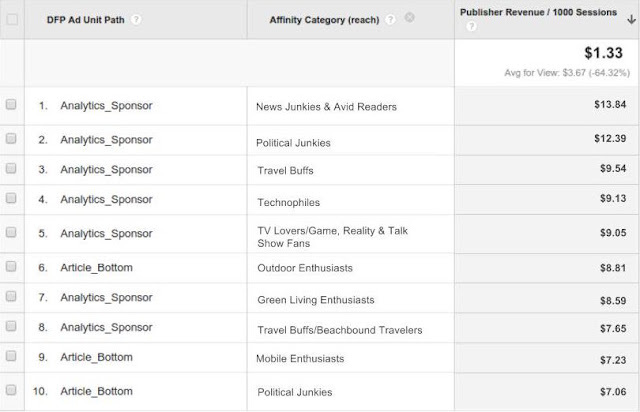 Also, ads by sponsors drove 14% more searches than their non-sponsor counterparts. 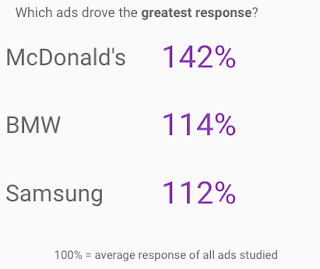 Compared to the average of the top 10 ads studied, McDonald’s drove 42% more searches. Finally, the Samsung Galaxy Note 7 ad was the overall winner with strong full-funnel performance placing in the top three across all three funnel stages. Whether people are tuning into the Olympics or their favorite TV show, they use their smartphones to search for information triggered by what they’re seeing. That means if you advertise on TV, you can now get a new view of performance across each stage of the funnel—using a combination of consumer surveys and digital response, all in a matter of days. Armed with these new insights, advertisers are now able to better understand and improve the performance of these investments in concert with their digital media. Using Google Surveys 360 to provide consumer ad awareness and interest research, an online survey was conducted in the United States during the period 8/6 - 8/9/16 using a validated, representative sample with a minimum of 750 respondents. Response data is based on incremental TV ad-driven search queries (Google and YouTube) during the course of the broadcast that are specific to the ad shown and are modeled by Google Attribution 360 to be attributable to the airings of the commercials. Response data is normalized for total commercial air time during the broadcast for each advertiser and indexed to the average. ). We thought you might feel that way at times, so we provide here some ideas for you to explore and build great Reports in Data Studio. In this post we will use a sample dataset from the U.S. Census Bureau. The data is about annual operating expenses of U.S. Retail, Accommodation, and Food Services between 2006 and 2014. 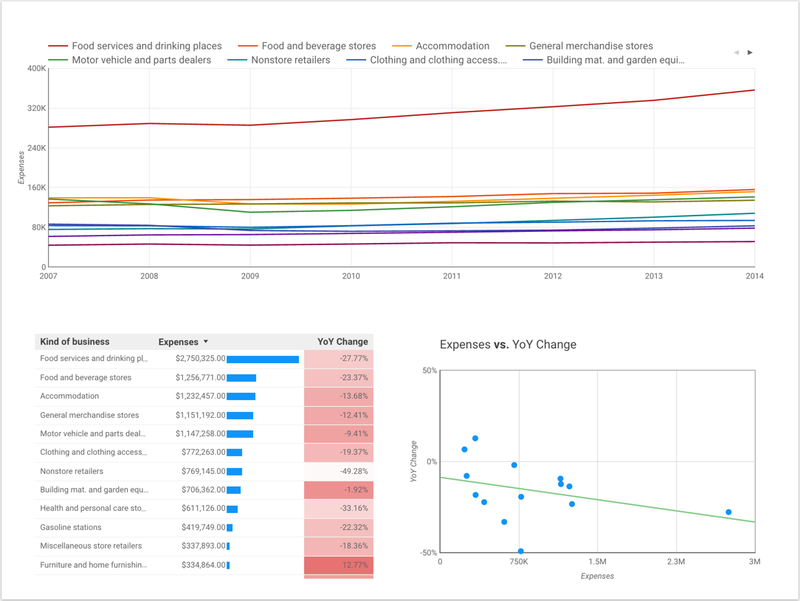 The dataset is not complex, just 10 types of businesses and their expenses in that time period. Here is the Google Sheet data that was connected to Data Studio. Now the important question: what should you do first when opening a blank canvas? Below is a set of three charts that will often give you some insight into the nature of data, they will help you to explore the data and build an insightful report. You will probably also have requests coming from your audience, but those can be helpful both for your own understanding and for enhancing those requests. Table: it is hard to find a better way to get a feeling for the data than tabular data! To help visualize the stats, you can also use bar charts and heatmaps inside the tables (see blue bars on second column and red heatmap on third column), they are pretty helpful visual clues especially in tables with lots of data. Scatter chart: the scatter charts are great to understand how two metrics correlate. In the screenshot above you will also note that there is a trend line (green) in the chart; it shows that as the expense grows, the YoY Change has a lower value, meaning that it decreases quicker. If you analyze and visualize data often enough, there are good chances that at some point you felt the “analyst’s block” (a less famous version of the writer’s block). We thought you might feel that way at times, so we provide here some ideas for you to explore and build great Reports in Data Studio. 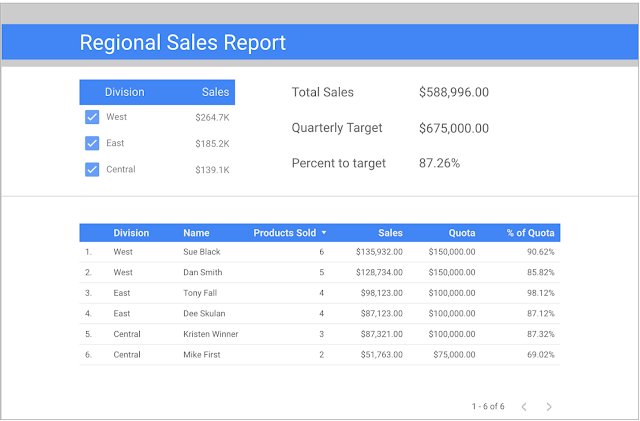 , we introduced Google Data Studio 360, to help you simply and beautifully present data from multiple data sources, including Google Analytics, Google Sheets and much more. In May, we introduced Google Data Studio, a free version of our tool, to put it in the hands of many more of you - which has led to the design and sharing of creative reports that bring your information to life. We’ve been excited to see the rapid adoption, and initiated a series of livestreams to answer questions around our design of the product, deliver demos and highlight features. Watch the first video in this series via the embed below or on YouTube here. This Spring, as part of our Google Analytics 360 suite, we introduced Google Data Studio 360, to help you simply and beautifully present data from multiple data sources, including Google Analytics, Google Sheets and much more.